I am neither intelligent enough to understand the behaviour of “Mr Market” – the manic-depressive dreamt up by investment guru, Benjamin Graham – nor foolish enough to believe I do. But he has surely been in a depressive phase. Behind this seem to be concerns about China. Is Mr Market right to be anxious? In brief, yes. One must distinguish between what is worth worrying about and what is not. The decline of the Chinese stock market is in the second category. What is worth worrying about is the scale of the task confronting the Chinese authorities against their apparent inability to deal well with the bursting of a mere stock market bubble.Stock markets have indeed been correcting, with the Chinese market in the lead. 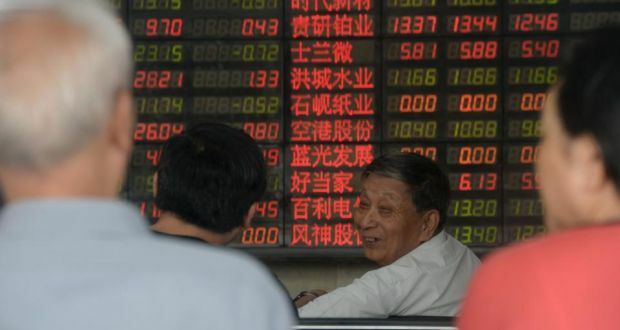 Between its peak in June and Tuesday, the Shanghai index fell by 43 per cent. Yet the Chinese stock market remains 50 per cent higher than in early 2014. The implosion of the second Chinese stock market bubble within a decade still seems unfinished. The Chinese market is not a normal one. Even more than most markets, this is a casino in which each player hopes to find a “greater fool” on whom to offload overpriced chips before it is too late. Such a market is bound to be extremely volatile. But its vagaries should tell one little about the wider Chinese economy. Nevertheless, events in the Chinese market are of wider significance in two related ways. One is that the Chinese authorities decided to stake substantial resources and even their political authority on their (unsurprisingly unsuccessful) effort to stop the bubble’s collapse. The other is that they must have been driven to do so by concern over the economy. If they are worried enough to bet on such a forlorn hope, the rest of us should worry, too. Nor is this the only way in which the behaviour of the Chinese authorities gives reason for concern. The other was the decision to devalue the renminbi on August 11. In itself this, too, is an unimportant event, with a cumulative devaluation against the US dollar of just 2.8 per cent so far. But it has significant implications. The Chinese authorities want room to slash interest rates, as happened this Tuesday. Again, that underlines their concerns about the health of the economy. Another possible implication is that Beijing might seek a revival of export-led growth. I find this hard to believe, since the global consequences would be devastating. But it is reasonable at least to worry about this destabilising possibility. A last possible implication is that the Chinese authorities are preparing to tolerate capital flight. If so, the US would be hoist by its own petard. Washington has sought capital account liberalisation by China. It might then have to tolerate a destabilising short-term consequence: a weakening renminbi. Recent events must be seen in the context of a deeper concern. The question is whether the Chinese authorities can and will secure a shift from an investment-led economy to a consumption-dominated one, while sustaining aggregate demand. If they can, the economy will also sustain growth of 6-7 per cent. If they cannot, economic and political instability threatens. China’s economy has already slowed. The talk of a “new normal” recognises this reality. But Consensus Economics has brought together alternative growth forecasts. The mean of these new forecasts shows growth of only 5.3 per cent in the year to the fourth quarter of 2015 . Suppose something like this were true. According to official figures, gross fixed investment was 44 per cent of gross domestic product in 2014. Figures for investment are more likely to be correct than those for GDP. But does it make economic sense for an economy to invest 44 per cent of GDP and yet grow at only 5 per cent? No. These data suggest ultra-low, if not, negative marginal returns. If so, investment could fall sharply. That might not lower potential growth, provided wasteful investment were cut first. But it would cause a collapse in demand. Everything the Chinese authorities have been doing suggests they are worried about just that. This worry about deficient aggregate demand is not new. It has been a big concern ever since the west’s financial crisis, which devastated demand for China’s exports. This is why China then embarked on its own credit-fuelled investment boom. Remarkably (and worryingly), the share of investment in GDP rose just as the growth of potential output declined. That was not a sustainable combination in the longer term. This now leaves the Chinese authorities with three huge economic headaches. The first is cleaning up the legacy of past financial excesses while avoiding a financial crisis. The second is reshaping the economy, so that it is more dependent on private and public consumption and less dependent on extraordinarily high levels of investment. The third is achieving all that while sustaining dynamic growth of aggregate demand. Recent events matter because they suggest the Chinese authorities have not yet worked out a way of pulling this triple combination off. Worse, the expedients they have tried over the past seven years have made the predicament even worse. Maybe, Mr Market has grasped how difficult this is going to be and so how destabilising some of the options the Chinese might choose actually are. These include devaluation, ultra-low interest rates and even quantitative easing. If this is the case, the market turmoil might not be foolish. The global savings glut can get worse. That would affect everybody.